Marco Giorgini [Apps] » Chalk Up! Chalk Up! 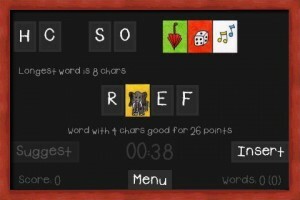 is a new exciting anagrams/word game for your iPhone/iPod/iPad/Android/Windows Phone device. With its two ways of playing (Letters Only / Letters and Pictures) and its three game modes (Normal, Caesar Code (+1) and Backward) you’ll be able to have fun while you’re checking your speed and your word skills. And with its OpenFeint support (six different leaderboars, and almost twenty achievements to play for) you can compete with your friends, and easily share your results on Facebook or on Twitter. If you feel brave just click on Play. If not, click on Letters+Pictures and it will change in Letters Only. Then click on Play. Give a look at the letters on the screen. If you have also pictures think at the name of the item in the picture, and consider that tile as that letter replacement. Check if you can compose a word with the given letters. If nothing comes into your mind, think about shorter words (like WE, AS, IT, SO and so on). Then click on the letters of your word in the right order. Just a click, you don’t have to drag. Click is faster and easier. If you clicked on a wrong letter (or you put a letter in the wrong position) click again on it, and it will go back to its original position. Once you have written your word – if the word exists in the game dictionary – you’ll see Insert getting brighter. When so, click on it and you’ll earn points and time bonus (depending on the length of the word). The letters you’ve used they’ll go away and they’ll be replaced with new ones. If really nothing comes into your mind – no way – and the Suggest item is white, consider to click on it. Be aware that if the longest word has got even a single vowel (so we’re sure you could get it) you’ll pay the suggestion with some of your points. Once you’ve mastered this game, consider changing the image set or trying one of the other two game modes. 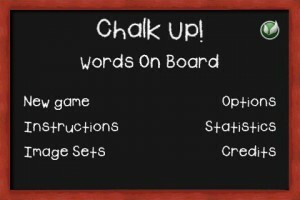 Chalk Up! is released as Universal App – so its graphics and its gameplay is optimized for iPhone/iPod – iPad and iPhone4. Depending on the international settings of your device you can have an Italian o English UI. You can play versus an Italian or an English dictionary. Feature not tied to UI language. Three image sets available: Generic (with objects and animals), Colors and Country Flags. Two ways of playing: Letters Only or Letters and Pictures. Three different game modes: Normal, Ceasar Code (+1) and Backward. In Chalk Up! you simply have to write as many words as you can in the given time, using on-screen letters or pictures (that stand for the first letter of their name). Every word you write will give you points and a bonus in seconds to extend the lenght of the game. So remember: longer words can be harder to find, but they mean more points and extra time! Be aware that once a letter is used to write a word, it disappears and it will be replaced with a new one. So a bit of strategy is needed, because you have to take care even of the letters you don’t use to write a valid word. Too many equal letters (or “rare” ones) left, or few vowels, can really lower your chances to keep on playing. Anyway, if during the game you cannot find any word to enter, and you’ve got enough points, you can buy a suggestion giving up part of your score. A suggested word won’t let you earn points or seconds, but it can be essential if things become too odd, and time too short. Chalk Up! will let you choose three different game modes: Normal, where you have to write words as you normally do (tree = T R E E), Ceasar Code (+1) or Backward. Ceasar Code (+1) requires that every letter of the word you want to write has to be shifted by one position along the normal alphabetical order (tree = U S F F, house = I N V T F), while Backward mode requires, instead, that you write every word from the last letter to the first one (tree = E E R T, house = E S U O H). Pay attention at the info about the longest possible word, and think if going for that, or if it’s better to quickly insert something shorter. Keep always an eye on how many similar letter (or vowels) are still available, and try even two letters words if the time is about to run out.